My, your balls look terrific! Even though I need to be finishing up Christmas stuff, I took a mini-break from it this morning and had some fun combing up roving balls. I didn’t spin at all since Travis had heisted the Louet, but that’s fine, since I was just kind of in the mood to play with fiber. Last night I went through some of our fiber stash and pulled out a selection of red, pink, and lavender fiber – mainly wool and mohair, but with a bit of hot pink tussah silk and some maroon sparkle fiber and this morning I combed them all up. The balls all look orangey-red on the outside, but they gradually fade into the other colors as the roving strip goes on. It should be pretty cool when I get a chance to spin it up. Travis and I also picked out a bunch of weirdo fibers at random, and tonight after he went to work I combed up a bunch of really funky roving balls (I’ll try to get pics of them tomorrow). These have some chunky mohair locks and some other bizarre bits and pieces in them. After spinning up the Hanukkah Joy and the Peach Fizz blingy sock yarns, I’ve been in the mood to spin something really artsy and shaggy and messy, so I think this set of roving balls will meet those requirements quite nicely. The last fibery thing we did today (well, Travis spun pretty much the whole day) was to get out some horrible wool roving we’ve had hanging around for a bit. 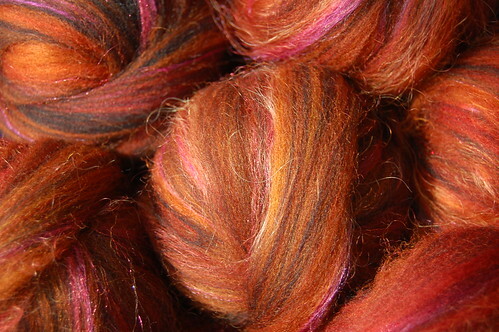 The fibers are really short and the wool is not soft at all. Anyway, Travis had the idea to try and comb it out on the hackle, so we got some of that fiber out and managed to make the wool at least spinnable (even if it still feels a bit scratchy). So I think an ongoing project is to eventually comb up all of this crap roving, and spin it into some big chunky yarn, and then I’ll weave rugs using the yarn. It’ll be nice to use up something that otherwise would be junk. Besides enjoying Ball Day, I finally finished up my Christmas knitting. Hooray! I wove in the ends of the last hat I was making this evening. I’m not completely happy with the hat, mainly because I’m not sure if the recipient will like it, but there’s only so much I can worry about. I’ve got my third Christmas scarf started (again, I’ll try to get pics tomorrow – hopefully, I’ll get the scarf completed tomorrow) and it looks really nice. So there shouldn’t be any problem in me getting that scarf done before my deadline, but weaving two scarves after that is starting to look pretty ambitious. Not sure what I’ll be able to get done, since I still need to sew my Christmas bags. The good thing about finishing up my Christmas knitting is that I get to start on a frivolous project for me – you know, something I can work on while I’m watching TV. So I think I’m going to cast on for a pair of socks knit out of some wonderful sock yarn I snagged from Amy’s Babies’ Etsy shop. I never posted a picture of it because the one I took was on a horribly dark day with no good light whatsoever. Anyway, the yarn is gorgeous – the deepest shade of black striped with this awesome turquoisey green vibrance. I can’t wait to cast on! I may do it when I’m done with this blog post! Like, right now! You have fabulous balls 😀 and I can’t wait to see your frivolous project!